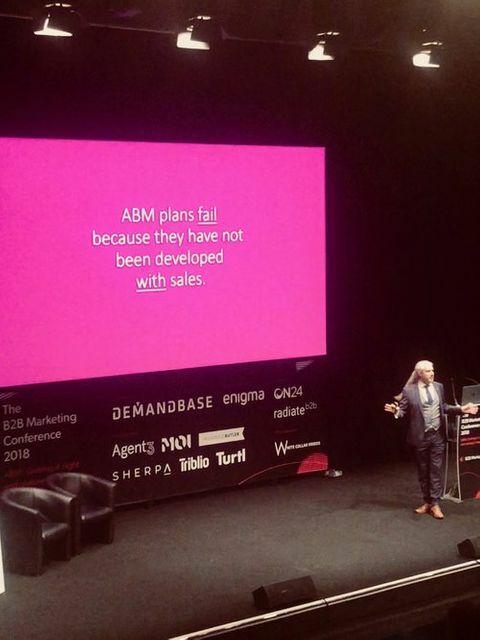 Being relatively new to the concept of Account-based Marketing, it was insightful to sit through a presentation by Adrian Hardy of BT at the B2B Marketing Conference on ABM. BT has successfully managed to build out a positive culture between the sales and marketing teams by aligning both sales and marketing goals. Winning over numerous sceptics in the process. There were a few lightbulb moments when discussing sales and marketing alignment from a goals perspective but even simple things like the language used between the two business divisions is important. It is also very apparent that the processes and procedures that need to be adopted really aren't rocket science! Content and enablement was a common problem as it is for many large companies. During the ABM journey at BT, one of the initial challenges was actually to get any of the sales team to sit down with me! This point has been echoed during the course of the day within the content of the presentations and is part and parcel of the ABM journey. I used to have black hair when I started in ABM at BT! As you can see from the photo below, Adrian hasn't lost any hair but it has gone grey. The main point here is that an ABM program doesn't just happen overnight and at BT there was evidently, a lot of blood sweat and tears to get to where they are now. After 6 months, there was a re-evaluation and rethink about the approach. A number of marketers in the room were nodding their heads at this point because ABM programs shouldn't be rigid in their implementation and should always be seen as work in progress. When applying Myers Briggs analysis, it was interesting to see that there are some similarities between sales and marketing teams. Both were Extraverts and Intuitive. Of course, Adrian eluded to the fact that other parts of the analysis showed large differences between the two and highlighted that the differences had to be managed with relationship building and alignment of goals. Moving from field-based marketing to account-based marketing allowed Adrian and his team to move from the 'colouring in department to the lighting up department'. ABM works best when the sales and marketing team are working in tandem and trust each other to hit the goals originally set out together. As a final leave behind, it is worth remembering a Jay Abraham quote ' The fact is, everyone is in sales whatever area you work in you do have clients and you do need to sell'. This point makes sense when bringing it back to the alignment of goals at the start- all parties need to have their commercial hats on. Adrian's experience in a mammoth company like BT mirrors a lot of the salient points in this great DnB article below. None of the success of ABM can take place without practising what you preach internally by building relationships, mirroring language and of course highlighting 'change agents' and 'strategic partners' who will drive the success forward. It got me thinking, ABM programs could and should be easier to implement for organisations. Not only that, but it doesn't need to take months or even years to prove the success. Enabling sales teams by supplying the right expert content in the hands of sales people at the right time is the key. Alignment doesn’t have to happen overnight. In fact, allowing the shift from “adjacent teams” to “strategic partners” to unfold organically can reduce some of the natural friction that such a change can bring. Those teams who can master inter-team communications have a lot to gain. Great leaders and great businesses think differently.